August 24 - 12:30 p.m. - Appearance on "The Bold And The Beautiful"
Just found out that Elliott will be in New Orleans at House of Blues on Oct. 23d! Now I don't know what to do--don't think DH will go to 2 concerts (23d and 24th) so far away...N.O. and B'ham..plus I want to go to Orlando too!!! Hi everyone, I am pea-green with envy that all of you get to see him solo. Sadly he is not coming anywhere close to where I live which is in Carson City, Nevada near Reno. Hopefully some of you will post pictures, videos, etc. Thanks in advance if you do. 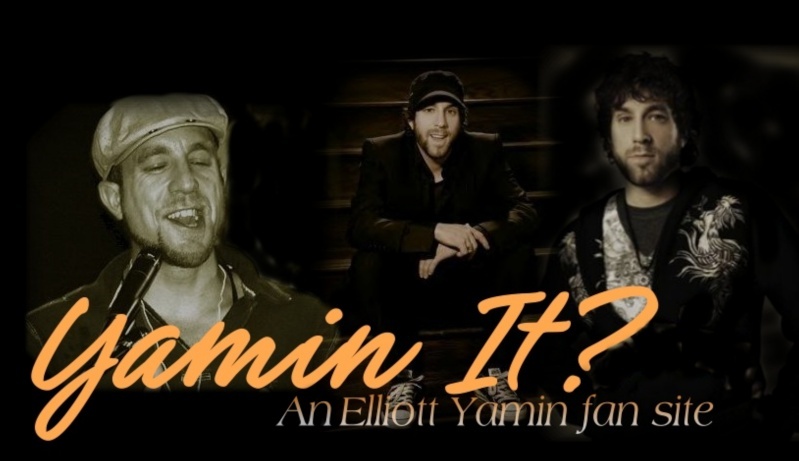 I don't know you've seen this site yet, but it's fans stories, pics and videos from every show during the spring tour....it's really wonderful...! I think I heard somewhere that there's going to be one in Cincinnatti? To Jeannine - I did see Elliott on the American Idol tour which was a thrill but had to drive 8 hours to get there and with all the costs involved it was somewhat difficult however seeing Taylor and Elliott was all worth it. This time I am waiting until he comes closer to me and hopefully that will be sometime soon. Glad I was able to give you a chuckle. To Babygirl - I live on the West Coast near Lake Tahoe and Reno, Nevada. They do have entertainment events there all the time so hoping E will come that direction. However if he comes in the winter to Tahoe I would have to pass on the show as it gets quite treachous driving up the mountain since we get snow and ice here in the winter and they close the highways alot. Anyway sure hope to see him in the future one way or another. Just adore that guy! Hey Jeannine, forgot to thank you for the info on the fan encounters. I did not know about it and went and read some of them. Sounds like Elliott is a great guy who appreciates his fans and gives his all. My closest experience to actually meeting him was during the rehearsal on AI when it was just Taylor, Katharine and Elliott. It was in Hollywood and I got to shake hands with him briefly as I did Taylor. What a thrill that was. Katharine on the other hand was very snooty to the fans and spent her time trying to hang on Ryan Seacrest. Then Taylor and Elliott did sign autographs on the other side of the building but we found out too late and just missed them. Regardless I am a die-hard fan of both and will see them in the future sometime I am sure. Anyway, thanks for the info! Ohh..I'd have loved to have seen them then....did you get any pictures?? Hi, concertcris! Josh Hoge said there would be 30 or 40 more stops put on the tour! Also if you go to www.myspace.com/joshhoge it looks like they are playing Nashville right after Birmingham!! Think it's 2 days later.. Awww..I'm glad you liked the site fanencounters, Mar worked really hard on that and i was MOST happy to send in my story (even though it was actually wayyyy longer but had to be cut)hehe....he really is a great guy and OMG...i waited sooo long to see him.....i on the other hand was not able to go to the AI concert but a friend of mine did out west so she mailed me the disc from all the tons of pics she took...that was awesome...I'll tell ya what though, i think it was MUCH MORE AMAZING to see him in a smaller venue......just thinking about that night...i was soooo close man i literally had HIS SWEAT hitting me! I'm NOT kidding...! I can't believe what this guy does to me and mostly everyone else here..lol! anyhow, your welcome and I'll say a prayer that he comes close to enough that your able to go and see..YOU MUST see HIM again! I'll pray for you too that he comes to Minnesota and i soooo can't wait to hear his christmas CD! WOOOT!!!!!! one more thing! I will take toooooonnnnnns of pics assuming that i'm able to go to a show! ARRRGGGHHHHH!!!!!!!!!!! Well I hope he doesn't forget Ohio!!! Until today I had no idea this existed.... found the link at another site. I can't vouch for it or anything, but it looks like they have special pre-sale tickets for some of the venues on-sale NOW. The whole thing is weird..... I don't think they charge anything, just have to register. Worth a look though, if you've already found a show you want to go to. 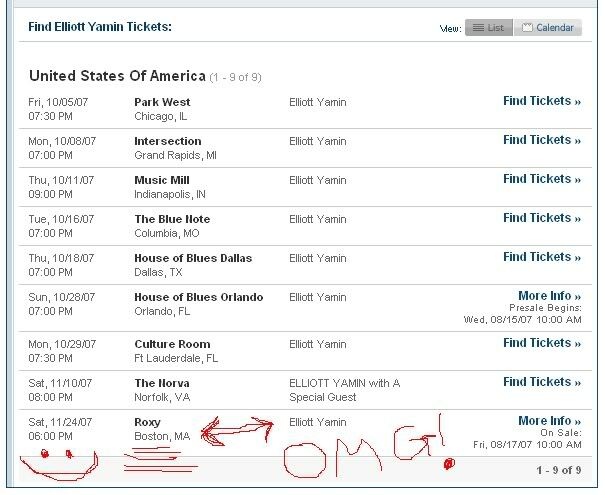 From Elliott's myspace, new dates and locations within!!! That Troy venue on 11/23 is LITERALLY 5 minutes from my house!!!! So, it would appear that I'm going to see him twice... two days in a row!!! Sorry they did not allow cameras inside the studio. However it was a special moment in my life anyway. Elliott was so awesome to the fans and you could tell he has a very fun personality. Taylor surprised me a little because at first he was quite shy but warmed up alot during the rehearsal and also let the fans know he was glad they were there. I was also very impressed with Ryan Seacrest as he made everyone feel special by shaking hands, giving out autographs and hugs. My friend who is a big fan of his was so thrilled with her hug and autograph. It was a very wonderful day and so exciting! I can't wait till Elliott comes to Chicago. I'm SOOOOO excited!